Last year we could watch the Strati 3D printed car and its test drive during the IMTS trade show that took place in Chicago. It is not the first 3D printed car, but Local Motors’ Strati has confirmed the concept of the direct digitаl mаnufаcturing model, with which customers can sketch custom vehicles and get them 3D printed with the equipment of large format, produced by Oak Ridge National Laboratory and Cincinnati, Inc. Oak Ridge is willing to push the cost savings, size and speed of their unique machine, whereas the Local Motors is willing to launch production of their business models in large numbers having two facilities for printing car this year. And don’t forget about 3D printing houses in China, that cannot be outdone. Observing the United States and other countries 3D print large constructions, the company known as WinSun began 3D printing a mansion and an apartment building. 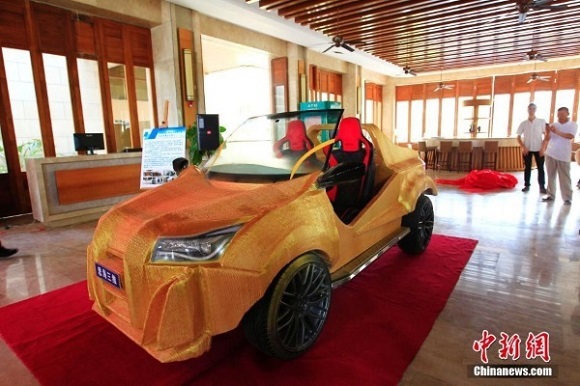 As Chinanews.com reports, the company called Sanya Si Hai 3DTechnology, Ltd, has manufactured its first 3D printed car, called “Shuya”, named after the city where it was produced. The frame of the vehicle was 3D printed in only five days from some composite material. The colour is “Tyrant Gold”. Together with its non-printed parts the total weight of the car is about 500 kg. Shuya can reach the speed up to 40 km/h. The electric motor drives the whole vehicle. To produce the car the company needed 500 kg of Tyrant Gold. 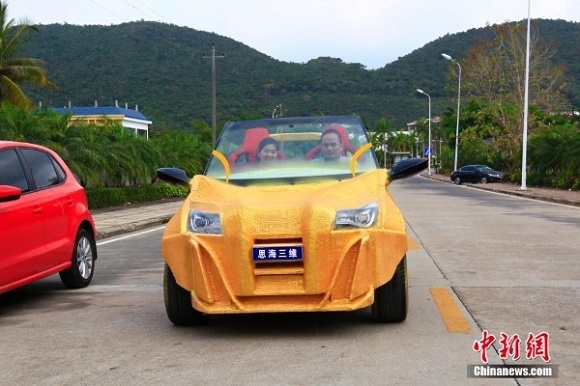 The final cost of the vehicle is $1770 (11,000 yuan), including 1000 yuan for labor and electricity and 10 yuan per 1 kg of 3d printing filament. The measurements of the car are 1,6 meters wide, 3,6 meters long. It has enough space for two passengers to sit. 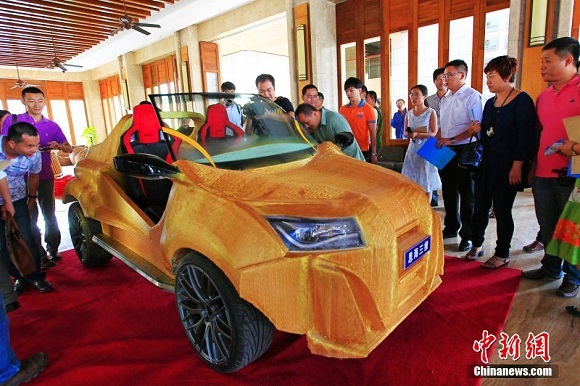 The 3D printed car by Sanya Si Hai 3D Technology took more time to be produced compared to the Strati, which was produced in 44 hours with CNC router and BAAM hybrid 3D printer. Nevertheless, the equipment that the company used to produce the car is rather heavy duty and its sizes were enough to print the whole boat. Would you ever resist driving a car that was 3D printed in Tyrant Gold?